Since XWiki 9.3 you can receive notifications in the top bar, under the Alert entry (represented by a bell). By default, users don't receive anything. They need to go to their profile preferences to select which kind of events (create, update, comment, etc...) they are interested in. You can find more information on the Notifications Application page. In the future, this application is meant to replace the Watchlist application and thus it'll be able to send emails to the users when a notification happens, or on a hourly, daily, or weekly basis. In XWiki you can subscribe to receive notifications either by RSS (the feed is automatically updated each time one of the followed pages gets changed) or by email. By using the Watchlist application an user can add specific pages and spaces to a personal watchlist. Manage your watchlist: change your notification preferences (available behind the "Profile" menu). 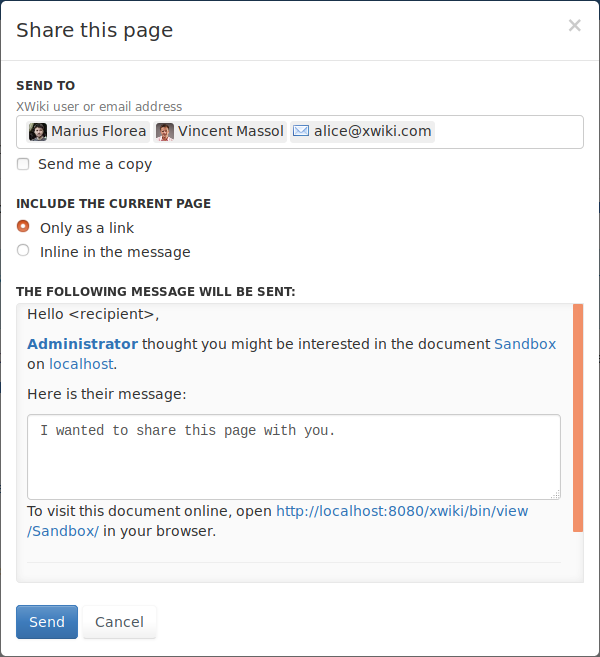 The Share Page Application allows sending a page by mail to someone (another user of the wiki or any email address). You can also get notification from activity taking place on an XWiki instance using RSS feeds.